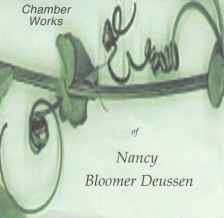 Nancy Bloomer Deussen Nancy Bloomer Deussen is a prominent San Francisco Bay Area composer and co-founder of the Bay Area chapter of The National Association of Composers, USA. 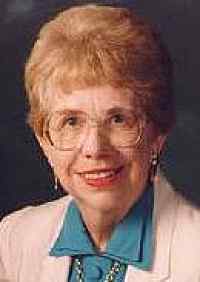 She has been a dedicated champion of more accessible contemporary music, a viewpoint amply demonstrated in all of her works. 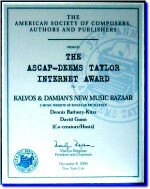 A composer who is well-loved by audiences, Bloomer Deussen has received numerous commissions from such performing ensembles and soloists as The Oakland Chamber Orchestra, The Walnut Street Chamber Ensemble (PA), The Baton Rouge and Augustana Concert Bands, The Santa Clara Chorale, De Anza College Chorale and Women's Chorus, The Women's Caucus in the Arts, Opus 90 Chamber Ensemble, The Gabrieli Brass, The Mission Chamber Orchestra, Sempervirens Environmental, Mu Phi Epsilon Ann and Lee E Mueller Chamber Music Commission and others. Her works encompass a wide spectrum of performers and include works for band, chorus, orchestra (full, string and chamber), many chamber music combinations, recorder consort, flute, clarinet and violin solo, piano solo, brass ensemble and solo voice and piano. She has received numerous performances by such orchestras and ensembles as The Marin Symphony Orchestra, The New England Philharmonic, The James Madison University Symphony, the Redlands Symphony, The Diablo Symphony, the Lowell Philharmonic (MA), The Iowa State University Orchestra, Kenyon College Orchestra (Ohio), The Mission Chamber Orchestra, The Vermont Youth Symphony, The Sandusky Music Festival (Ohio) and numerous chamber ensembles, brass ensembles, bands and soloists across the country. 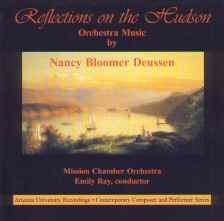 Ms Bloomer Deussen is the recipient of a number of awards which include: First Prize Winner of the Mu Phi Epsilon Original Composition Contest (for chamber works) in 1987 for "Woodwind Quintet", The Bay Area Composer's Symposium Award for her orchestral work "Reflections on the Hudson" in 1994, The Britten on-the -Bay First Prize for "Trio for Violin, Clarinet and Piano" in 1996 and the Mu Phi Epsilon Original Composition Contest (for large works) for "Concerto for Clarinet and Small Orchestra" in 1999. Ms. Bloomer Deussen is available for commissions and residencies, as well as performances and her works are available (scores and tapes) for perusal.